Do you frequently host corporate visitors to Santa Maria? Perhaps you’ve planned a destination bachelorette party and your guests will be flying into LAX? Well, whatever the event or occasion, you likely want to impress your guests and the best way to start is with an airport chauffeur who will get them to and from the airport and Santa Maria with minimal fuss. Why? Private airport transportation offers distinct benefits. Here are just some of the benefits of using a professional airport chauffeur service from Silk Road Transportation. Everyone wants a warm welcome after their flight. With a professional and friendly chauffeur, that’s exactly what your guests will get. A chauffeur will meet your guests at either LAX or the Santa Maria airport terminal and take them to a luxurious vehicle for a comfortable ride to their final destination. Getting into a luxurious vehicle like a black car or limousine will re-energize your guests and give them the chance to recoup before their business meeting or wine tasting weekend extravaganza. Our car interiors are luxurious and relaxing, allowing your guests to unwind in style both before and after their flights. A private airport transportation service means your guests get a well-trained, experienced chauffeur for their ride to and from the airport. If they’re coming to Santa Maria for business, it gives them the chance to think about meetings and presentations without worrying about navigating traffic or getting to their destination on time. 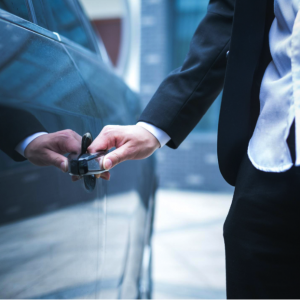 With a local chauffeur, your guests can rest assured they’ll get to their accommodation or make their flight on time. Our drivers know the city. That means they know the shortest routes and the best ways to get your guests safely where they need to be. Getting to an airport late and missing a flight is a nightmare. But, with a professional chauffeur, your guests are sure to arrive on time, taking away a great deal of stress. We know that timely detours, traffic delays, and road construction are all big stressors. That’s why our dedicated staff keep track of traffic patterns to make use of the most efficient route to get your guests to their destination. If you’re planning on hosting guests in Santa Maria soon or collecting clients from LAX, it’s time to consider hiring private airport transportation to eliminate stress and ensure timely, relaxing arrivals. Talk to Silk Road Transportation today for all your private airport transportation requirements.